In the world of web design, complexity is often mistaken for sophistication or success. As a designer, I've never been more empowered to create websites that push the limits of what was previously considered possible. As a marketer who cares about the underlying business objectives of our clients, I've never felt more exhausted by the teeter-totter of balancing innovation with practicality. There are a multitude of factors that determine whether or not a website design is successful, usable, high-converting, or even attractive. And while there are more than enough tools that allow us to measure these outcomes after our designs have been implemented, that doesn't mean we should overlook implementing UX best practices upfront. 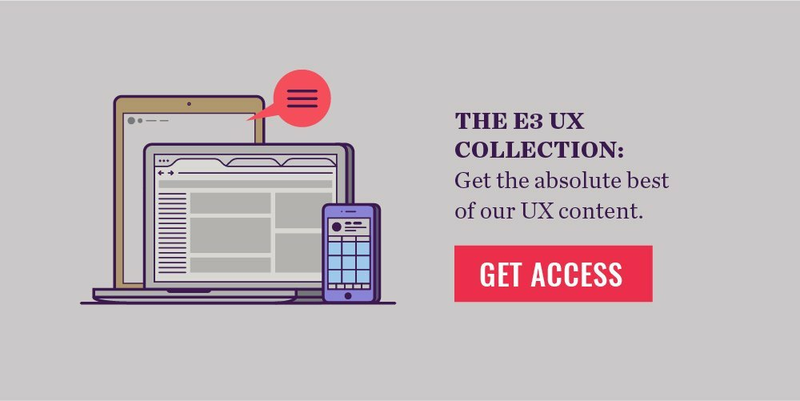 I want to talk about 5 UX design myths that are costing companies millions of dollars in revisions, and how the alignment of user experience, clear objectives, strategy, and creative can be used to combat them. Because after all, design should help solve our problems, not create prettier issues. One mistake some brands, designers, and agencies make is thinking their aesthetic, style, or design direction is more important than the purpose of the site, its content, usability, accessibility, or even its users. There are implications and consequences for every design decision in a website project – some can cripple performance, others can result in a frustrating user experience. I understand the desire to innovate, to create something truly unique and creative, but if it comes at the cost of important considerations, maybe it’s gone too far. I’m not saying that style, design or art direction are not important – quite the opposite, I think they are critical. But they need to be intentional and open to iteration. The look and feel of a website should support the user experience, not impair it or overshadow it. One of the benefits of a multi-disciplinary team working closely together is that you have different perspectives offering insights into the design, making it better and more usable. Menu titles that clearly indicate to users what the page is. This is a pet peeve of mine, but when you name a page something that is vague and seems to have little context – something like “It's rainy outside,” “Tech Machina,” or “Social Soup” – what could that page possibly be? Calls to action that clearly resemble a button, with copy that gives users an idea of what they are clicking. Boring buttons aren’t quite as fun, but if it looks like a button, it’s more likely users are going to click on it. Yes, you can create custom icons or type treatments to make your CTAs stand out, but remember – if it doesn’t look clickable, it’s small, or it’s too subtle, it’s likely to perform poorly. Headlines, copy, and images that support each other and provide context. These three things should help communicate and educate, not create additional questions. Nielsen Norman Group did a study that showed most users completely ignore images that are purely decorative, feel-good, or fluff. On the other hand, if the photos are relevant and they show real people and products, they get more attention. If any one of these items feels disconnected or irrelevant to the rest, it can create confusion and at times outright indifference toward the content. When user cues are ignored, it can be quite a jarring experience. Where does this take me? What am I supposed to do on this page? I can’t read the text. What is this purpose of this page? It’s almost never a good idea to have the design of your website happen independently, or without any involvement or collaboration with digital strategists, developers, and copywriters. When design and development are siloed and digital strategy is not included, sites often cannot overcome their shortcomings. Furthermore, these processes typically lead to increased money and time spent trying to fix problems after-the-fact, leaving us with inferior websites at twice the price of their quality counterparts. Is it useful to users? Is it relevant to what the users need? Is it usable? Does the idea impact usability or accessibility in any way? There is a good deal of confusion around UX, including whose responsibility it is, what it means, and how it should be practiced. Some believe it rests solely in the realm of digital strategy, others believe it is a separate discipline altogether that should only be practiced by a seasoned UX professional (you may have heard before, “We need to hire a UX person so we have that covered”). In my estimation, it is a responsibility that should be shared and practiced across disciplines. It is important to have UX advocates within your organization, and it certainly helps to have a dedicated professional that spearheads the practice, but to be really dedicated to a great user experience requires an entire team to be user-focused. This applies equally to internal marketing teams and agency partners and especially to the collaboration between the two parties. When one side of the relationship doesn't understand the value of UX (or doesn't really understand it), it will be difficult to invest the appropriate time and resources and to find consensus. Conversations must begin with the business impact ("How will this drive conversions. engagement, SEO, etc.?") and strategy ("How will we know what a great user experience looks like?") before you even begin to craft the specific user journeys you aim to facilitate. Without a well defined business case for UX, the whole process is likely to seem like a lot of unnecessary nitpicking and fluff. As far as how you craft great user experiences, you could write a book on it (and lots of people have! ), but one tried-and-true method is to implement user testing and user research as early as possible to see how people are interacting with your website. Great UX is an iterative process that must be continuously optimized, tested, and analyzed. While this process can be time consuming, the rewards are great, and they have much larger implications for brand perception implications and digital-based marketing goals than we might initially assume. This line of thinking is often the result of agencies, designers, and companies thinking that if they do something that hasn’t been done before, or if their site looks different than conventional sites, that alone makes it a marketplace differentiator. Naturally those in the creative field have the desire to create truly unique experiences, especially in the context of a web that often looks the same. More than once I have heard creatives, managers, and clients alike lament that all websites look the same. While no one wants their business’s website to look just like a dozen other industry sites, it gets dangerous when conventions are completely bucked without regard to the user. One of the reasons we see common design patterns in websites is because users are familiar with a convention and know how to use it. If you are a Google Docs user and suddenly Google changed the entire interface, you would feel confused and probably frustrated. When websites and apps like Facebook or Instagram add new features or update their UI – users complain en masse because there’s a lack of familiarity. Obviously this doesn’t stop companies from innovating or creating new interfaces or UX patterns, but these types of undertakings should not be taken lightly or executed purely for aesthetic reasons. If you're going to push the envelope, do so with purpose. For those whose heads are spinning, don't get overwhelmed. Find talented individuals who can help guide you through this journey as it applies to your own digital channels. And if you have any questions you'd like for our team to answer, send them to marketing@elementthree.com, and we'll be sure to answer any and all of them.